Summer is a great time for fresh salads. And with July being the national month of blueberries, consider creating your own fruity and tangy summer salad. Blueberries are a stress-busting food. They are a great source of vitamin C and they have antioxidants, which can help protect you against cancer. They also help provide a significant portion of your daily fiber needs! Finishing this dish off with fresh pecans or walnuts, great source of vitamin E and fiber, will help you have a mindful and balanced meal. In either a food processor or a sealable container, mix the first six ingredients till they are blended well. 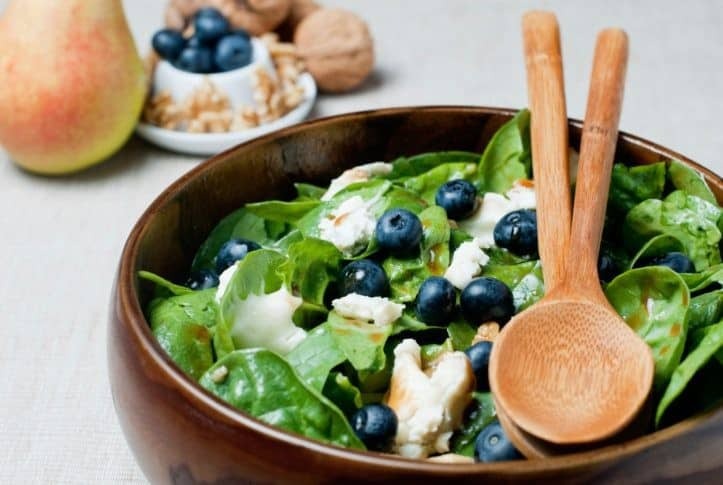 After washing the blueberries and the mixed greens thoroughly, toss the remaining four ingredients into a large bowl and add your dressing as you wish! For more flavor, we suggest using toasted pecans or walnuts, but for more vitamin power go for the raw version and feel free to substitute your favorite cheese such as a low fat feta or throw a ½ cup of blueberries in with your dressing ingredients to make a blueberry vinaigrette (you will need to use a food processor for this version).